Fly to Alice Springs today. You will be personally met at the airport by a DISCOVER AUSTRALIA representative and transferred from the airport to your hotel. Meet and Greet Personalised Arrival Transfer, Overnight Alice Springs Accommodation. Your Central Australian adventure starts off today by exploring the modern face of the historic pioneer town of Alice Springs, famous for Afghan cameleers, gold-diggers, flying doctor base, school of the air, The Ghan train, the usually dry Todd River, the Simpson Desert, 'A Town Like Alice', contemporary Aboriginal art (Todd Mall) and the Aboriginal Arrernte people who have lived here for 20,000 years. 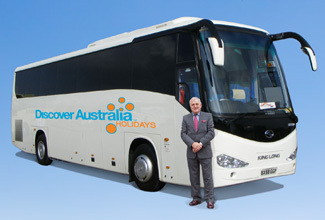 Enjoy our 4.5 hour luxury coach tour with great informative commentary from our experienced local guide. Visit the Royal Flying Doctor Service (headquarters of the globally respected medical service providing a critical link to remote communities throughout the Northern Territory), Historic Telegraph Station (site of the first European settlement in Alice Springs, established in 1872 to relay messages between Darwin and Adelaide), School of the Air (provides education to primary school aged children living on remote properties throughout the Northern Territory since 1951), Anzac Hill (dedicated as a war memorial to honour those that fallen in Australian's wars) and Alice Springs Reptile Centre (amazing NT animals like, saltwater crocodiles, huge goannas, frill-neck lizards and Gecko Cave). You will also get a great orientation of thriving Alice Springs, touring through the town and seeing the other main attractions such as the Cultural Precinct, National Pioneer Women's Hall of Fame, Road Transport Hall of Fame, Old Ghan Train Museum, Olive Pink Botanic Gardens and Todd Mall. Enjoy some free time. Perhaps explore some more of Alice Springs or just relax in your hotel, taking advantage of the great facilities. Alice Springs Luxury Coach Tour with Hotel Pick Up, Overnight Alice Springs Accommodation. Alice Springs is Australia's most famous and iconic outback town, situated in the vast Red Centre the town is steeped in a proud pioneering history and has a colourful Aboriginal culture, visit the venomous snakes at the Reptile Centre, buy Aboriginal 'dot-paintings' from art galleries, shop at the vibrant Alice Springs Street markets and birdwatch at the nearby desert park. Explore Alice Springs at your own leisure today. Kata Tjuta (The Olgas) is set in the Uluru-Kata Tjuta National Park in Australia's Northern Territory, the 36 ochre domes that make up Kata Tjuta are an incredible sight and cover an area of some 20 km, there are a maze of walking and hiking tracks of varying difficulty, at sunrise and sunset the domes take on a magical appearance as they turn a deep shade of red. Stop at a camel farm on your journey south from Alice Springs, view Atila (Mt. Conner), visit Kata Tjuta and explore the domes at Walpa Gorge before reaching the Uluru sunset viewing area. Luxury Day Tour with Hotel Pick-Up, Special Kata Tjuta Sunset Canapes and Wine, Overnight Ayers Rock Accommodation. The majestic rock formation Uluru is better known as Ayers Rock, this mighty and impressive monolith is one of Australia's best known natural landmarks and is sacred to the Aboriginal people, Uluru stands some 348 metres high and is 3.6 km long, its surface is made of of valleys, ridges and caves that were created over millions of years by erosion. Experience the sunrise at Uluru and a drive around the base of Uluru. Discover the Mutitjulu Waterhole, visit the Uluru – Kata Tjuta Cultural Centre and explore the Valley of the Winds. Uluru is Australia's best known and most iconic natural landmark, this majestic monolith lies 335 km southwest of Alice Springs in Australia's Red Centre, Uluru's surface is made up of ridges, valleys and caves that were created over millions of years by erosion, Uluru is steeped in indigenous tradition and culture and is sacred to the Aboriginal people. Enjoy some free time at Ayers Rock before travelling to Kings Canyon. Drive to Kings Canyon, Overnight Kings Canyon Accommodation. Kings Canyon is situated in Watarrka National Park in Australia's Northern Territory, a climb to the top of this ancient sandstone rock formation rewards with sensational views of the gorge and surrounding landscape, a guided rim walk with an Aboriginal elder gives a fascinating insight into the Aboriginal culture of this ancient and mystical place. Climb to the rim of Kings Canyon or take a shorter walk along the canyon creek bed, travel back to Kings Canyon Resort for lunch then make your way back to Alice Springs. Kings Canyon Walk, Return to Alice Springs, Overnight Alice Springs Accommodation. You will be personally met at your hotel by a DISCOVER AUSTRALIA representative and transferred from your hotel to the airport to meet your flight home. Your special overnight Luxury Coach Touring includes 1 meal. The luxury vehicle has a personalised air-conditioning, a video system and an onboard toilet. You have 3 choices of accommodation in Alice Springs. Our "Good Standard" central Alice Springs hotel has great facilities, a comfortable room and friendly service (typically 3.5 stars). Alternatively, why not treat yourself? The "Deluxe" hotel has superior facilities, stylish room and first class service (typically 4 stars). The “Luxury” hotel is upscale with a more luxurious feel for the discerning traveller and great for celebrating an anniversary (typically 5 stars). You will be personally met at the airport by a DISCOVER AUSTRALIA representative and transferred from the airport to your hotel and from your hotel to the airport to meet your flight home. You’ll receive the FREE DISCOVER AUSTRALIA Bonus Voucher Book that includes $500 value of discounts and bonuses throughout Alice Springs and th NT at shops, restaurants attractions etc. It’s a great way to save even more on your Northern Territory holiday. The "Deluxe" hotel option has superior facilities, stylish room and first class service (typically 4 stars). Upgrade this package to 5 nights in a "Deluxe" Alice Springs hotel, from just $100 per person. The “Luxury” hotel option is upscale with a more luxurious feel for the discerning traveller and great for celebrating an anniversary (typically 5 stars). Upgrade this package to 5 nights in a "Luxury" Alice Springs hotel, from just $200 per person. 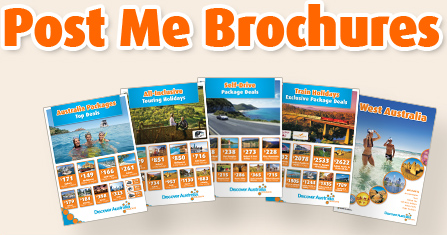 The Alice Springs, Uluru Ayers Rock, Kata Tjuta Olgas & Kings Canyon Touring is very popular. Many dates book out well in advance, please book soon.